HOME Hiding Picture of an underground bunker. 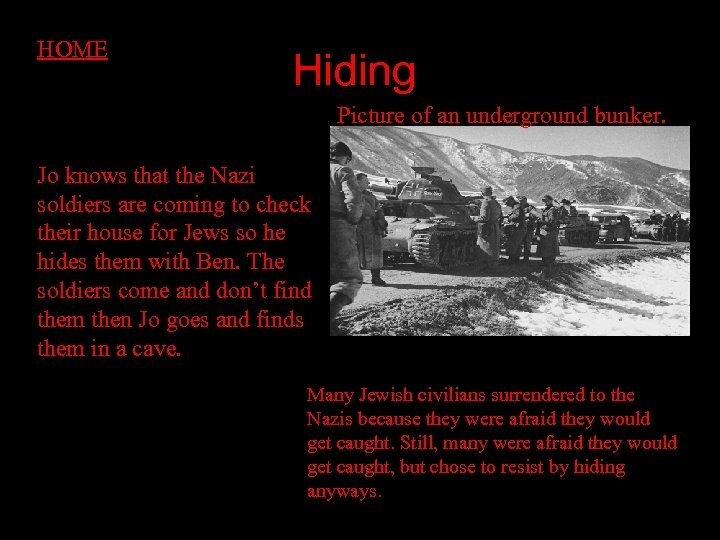 Jo knows that the Nazi soldiers are coming to check their house for Jews so he hides them with Ben. The soldiers come and don’t find them then Jo goes and finds them in a cave. Many Jewish civilians surrendered to the Nazis because they were afraid they would get caught. Still, many were afraid they would get caught, but chose to resist by hiding anyways. 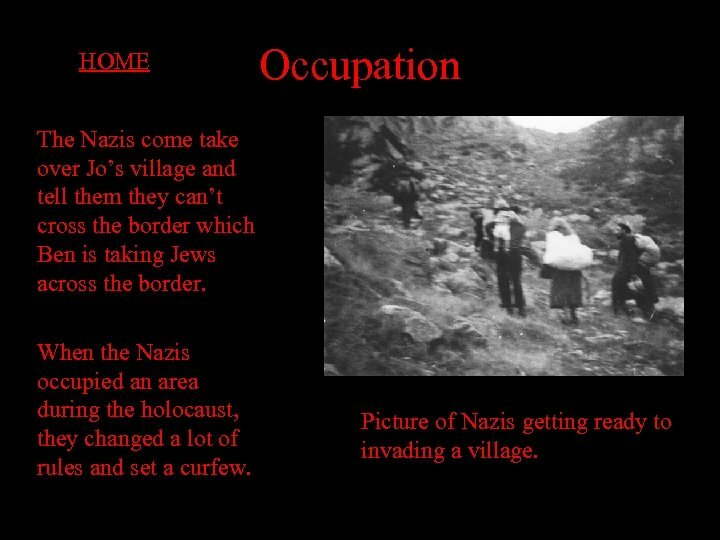 HOME Occupation The Nazis come take over Jo’s village and tell them they can’t cross the border which Ben is taking Jews across the border. When the Nazis occupied an area during the holocaust, they changed a lot of rules and set a curfew. Picture of Nazis getting ready to invading a village. 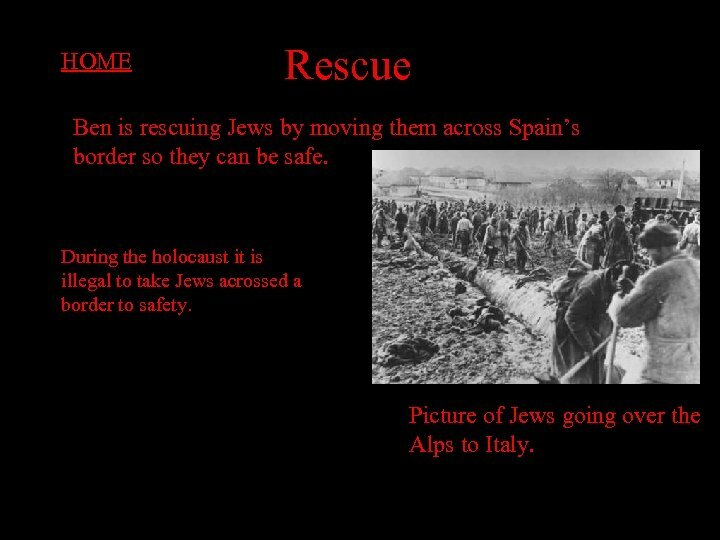 HOME Rescue Ben is rescuing Jews by moving them across Spain’s border so they can be safe. During the holocaust it is illegal to take Jews acrossed a border to safety. Picture of Jews going over the Alps to Italy. HOME Prisoner of War The father was a prisoner of war four years and he gets out and his daughter doesn’t even recognize him. 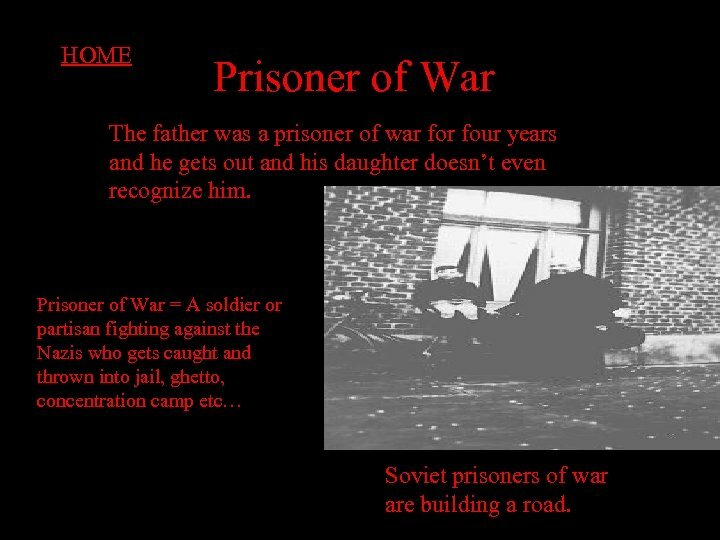 Prisoner of War = A soldier or partisan fighting against the Nazis who gets caught and thrown into jail, ghetto, concentration camp etc… Soviet prisoners of war are building a road. 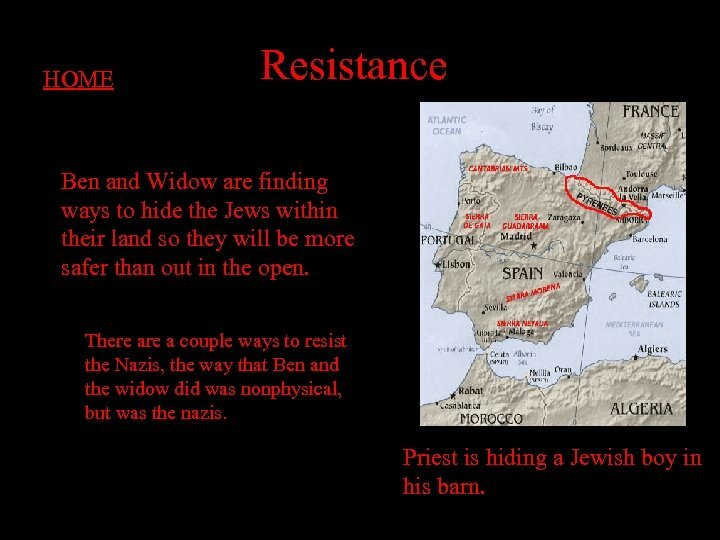 HOME Resistance Ben and Widow are finding ways to hide the Jews within their land so they will be more safer than out in the open. There a couple ways to resist the Nazis, the way that Ben and the widow did was nonphysical, but was the nazis. Priest is hiding a Jewish boy in his barn. HOME Auschwitz Ben and Leah get sent to a concentration camp after getting caught and soon later get killed at Auschwitz death center. Auschwitz is a death camp where 4. 1 million Jews were murdered. 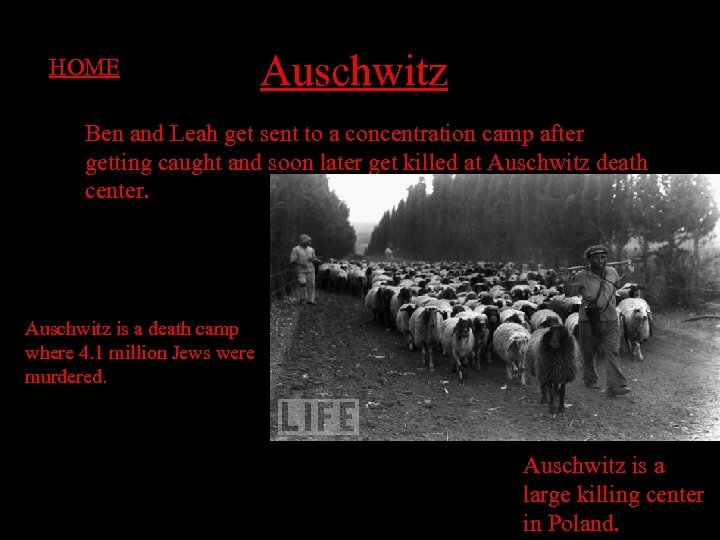 Auschwitz is a large killing center in Poland. 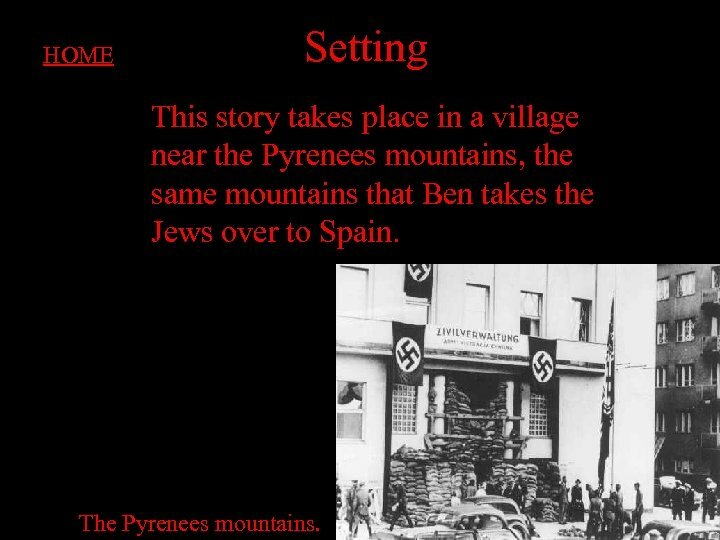 HOME Setting This story takes place in a village near the Pyrenees mountains, the same mountains that Ben takes the Jews over to Spain. The Pyrenees mountains. 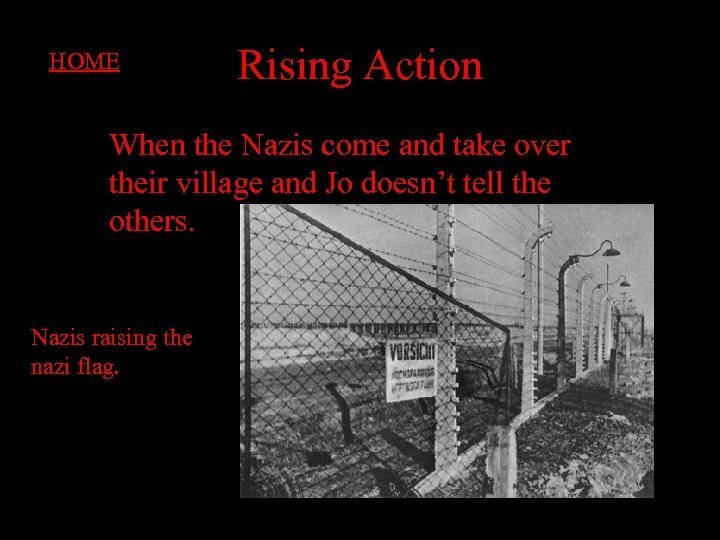 HOME Rising Action When the Nazis come and take over their village and Jo doesn’t tell the others. Nazis raising the nazi flag. 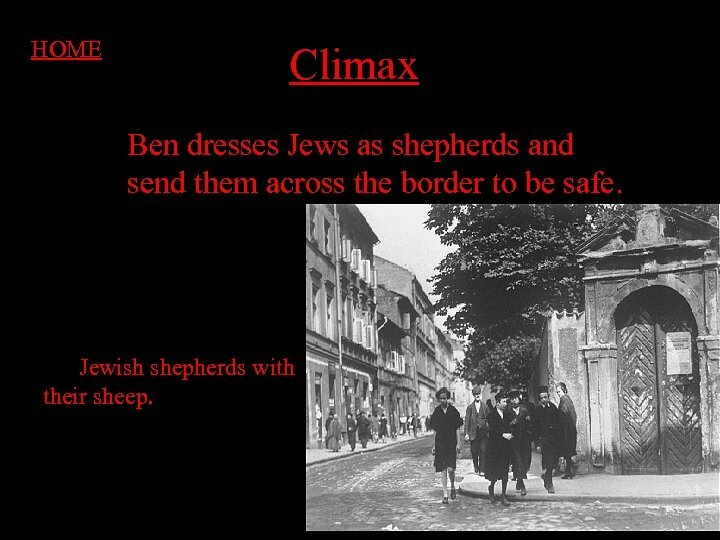 HOME Climax Ben dresses Jews as shepherds and send them across the border to be safe. Jewish shepherds with their sheep. 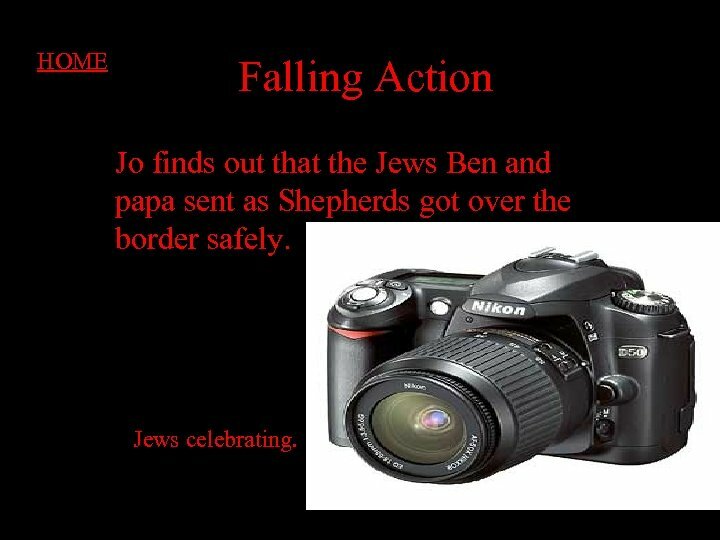 HOME Falling Action Jo finds out that the Jews Ben and papa sent as Shepherds got over the border safely. Jews celebrating. 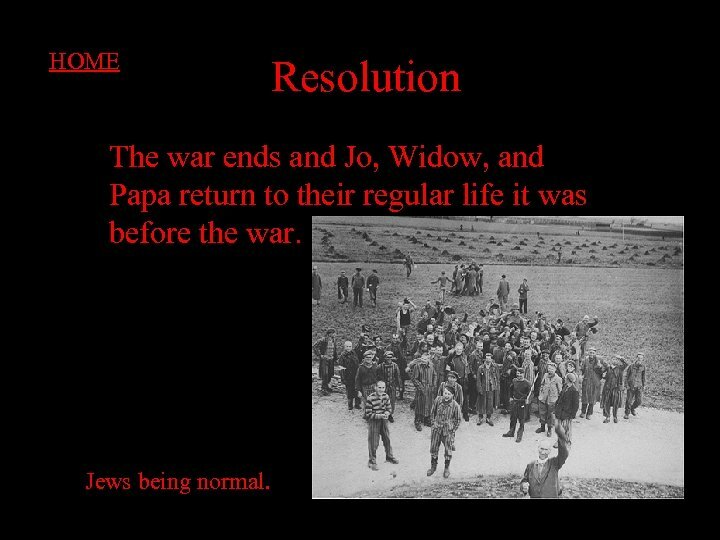 HOME Resolution The war ends and Jo, Widow, and Papa return to their regular life it was before the war. Jews being normal. 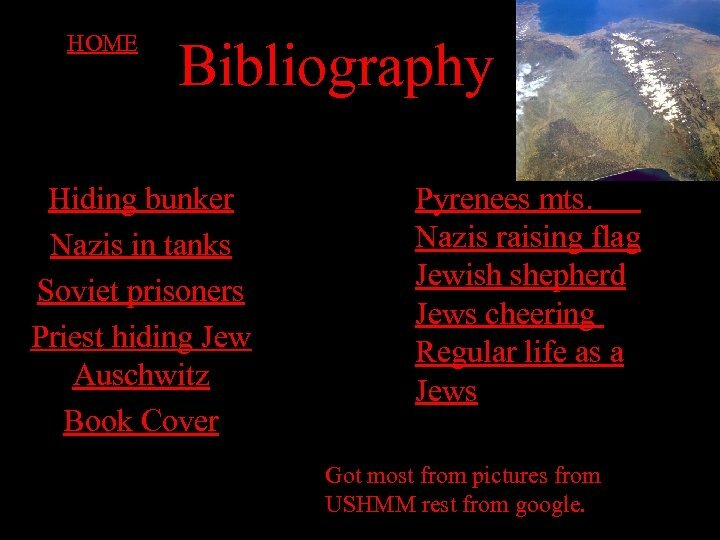 HOME Bibliography Hiding bunker Nazis in tanks Soviet prisoners Priest hiding Jew Auschwitz Book Cover Pyrenees mts. Nazis raising flag Jewish shepherd Jews cheering Regular life as a Jews Got most from pictures from USHMM rest from google.